Specific Object / David Platzker is pleased to announce the opening of the exhibition Sammlung Ludwig : Art of the Sixties & Hans Haacke : The Chocolate Master. The exhibition will be on view at Specific Object from February 28 through April 29, 2011. 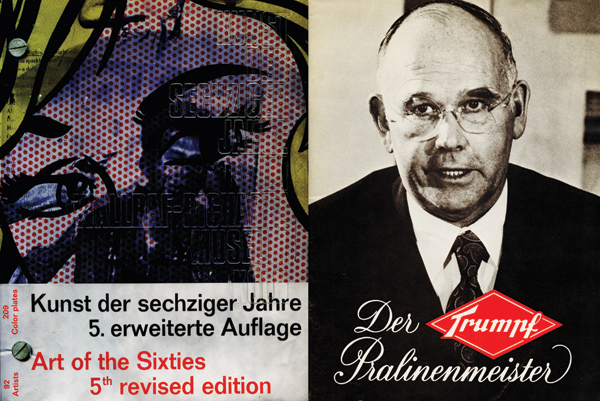 This exhibition celebrates two unique books: Sammlung Ludwig : Art of the Sixties and Hans Haacke’s The Chocolate Master / Der Pralinenmeister. "The role of the private art collector is well know. To a large degree the public museums are the beneficiaries and heirs of the private collector. Nowhere is his role more important than for contemporary art. Whatever the qualifications of those making decisions for public collections, imbedded as they are in the rules of bureaucratic order; the private collector can acquire today what the majority will understand in years hence." "The German chocolate manufacturer and art collector Peter Ludwig once said: 'The market for Pop Art has been determined by the activities of Mr. and Mrs. Ludwig.'" Sammlung Ludwig : Art of the Sixties, was designed by Wolf Vostell to document and commodify the collection of the German chocolate manufacturer Peter Ludwig and his wife Irene. Produced in five expanding editions between January 1969 and November 1971, the catalogue is one of most sought-after design objects of the period. Clad in clear vinyl covers, a Plexiglas spine, stainless steel screw binding, transparent pages with artist portraits and an encyclopedic content of art of the Sixties as collected by the Ludwigs. The Sammlung Ludwig defines great design and voracious collecting. The Chocolate Master / Der Pralinenmeister, by Hans Haacke and published by Art Metropole in 1982, is an artists’ book that parallels the artist’s unique work, Der Pralinenmeister, produced in 1981. Within The Chocolate Master Haacke deconstructs Ludwig’s chocolate empire: Ludwig’s use of low wage immigrant labor; his use of tax breaks and interest free loans to expand his businesses while driving labor costs down and his income up; as well as Ludwig’s use of his collection as a means of garnering governmental [taxpayer] support to service his collection while it was on permanent loan in the Museum Ludwig in Cologne, Germany. (1) Kunst der Sechziger Jahre im Sammlung Ludwig im Wallraf-Richartz Museum Köln / Art of the Sixties, Wallraf-Richartz Museum, Köln, 1969, pp. 23-24. (2) Hans Haacke : For Real, Works 1959 – 2006, Richter Verlag, Düsseldorf, 2006, pp. 154-157.